» Fuel Outdoor Continues to Challenge San Francisco Sign Ban Despite Losing in L.A.
Fuel Outdoor Continues to Challenge San Francisco Sign Ban Despite Losing in L.A.
After a federal court judge ruled two years ago that Los Angeles couldn’t ban advertising signs on private property if it allowed the same kind of signs in bus shelters and other pieces of “street furniture,” the company that sued the city filed a nearly identical claim against the city of San Francisco, which also bans signs on private property but has a street furniture program. However, that ruling in the case of Metrolights (now Fuel Outdoor) vs. City of Los Angeles was reversed by the 9th Circuit Court of Appeals early last year, and in December the U.S. Supreme Court declined to review it. End of the line for this rogue sign company, which has also put up unpermitted signs in New York and Philadelphia, among other major cities? Not quite. 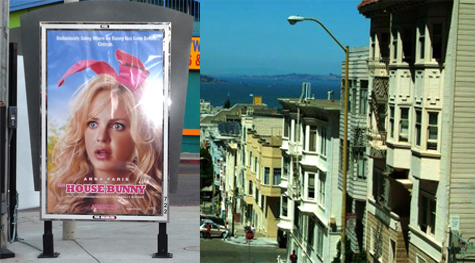 While the challenge involving San Francisco’s street furniture program was dismissed, the company is still attempting to have the city’s ban on off-site advertising signs declared unconstitutional on other grounds. One of those claims is that the city’s 2002 off-site sign ban, adopted by city-wide initiative that garnered 70% of the vote, is unconstitutional because it allows the city to have a monopoly on advertising signage, through the street furniture program or other signage allowed on public property. A second claim is that the ban unconstitutionally discriminates against non-commercial speech. How does it do that, when commercial advertising signs are what the sign ban prohibits? According to the Fuel Outdoor lawsuit, non-commercial signs—for example, signs with political messages—are by definition off-site, since on-site signs advertise the businesses where they are located. Therefore, the lawsuit claims, the city is actually making a distinction based on the content of signs, which is unconstitutional. No hearings have yet been held in the case. Fuel Outdoor’s business also includes street furniture, billboards, and supergraphic wallscapes. The company is one of more than a dozen with pending lawsuits against L.A.’s ban on supergraphic signs, but all those suits have been stayed pending the outcome of the city’s appeal to the 9th Circuit of an adverse ruling in one of the cases. The New York-based company is a subsidiary of Och-Ziff, a multi-billion dollar hedge fund.